I realized that I was in love with the London Underground on my recent trip. It also reminded me that Delhi Metro is my preferred mode of transport in my own town. So when the opportunity came to visit Thailand I decided to extend my stay. My sole purpose was to explore Bangkok by BTS on those extra days. And what fun it was! I have been to Thailand 8 times, 7 times with the Tourism Authority of Thailand, including the present trip. I feel comfortable out there. But this was the first time when I was staying back, extending my trip and roaming around on my own. I am glad I did that. My trip started at Bangkok, I went on to Amphawa, Hua Hin and Kanchanaburi and then came back to Bangkok at the end of the trip. While I was the guest of Tourism Authority of Thailand I was staying at Courtyard by Marriott. 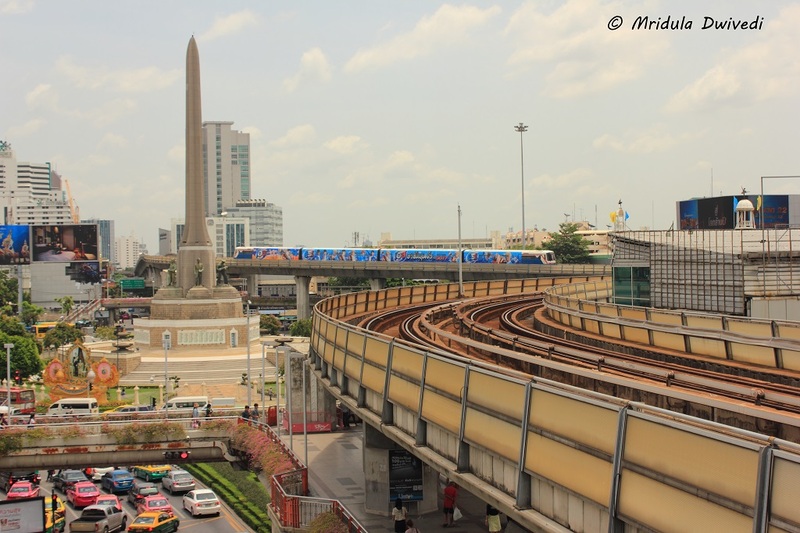 It has two BTS stations close to it Chit Lom and Ratchadamri. For one night I stayed on my own and I shifted to a less expensive hotel Studio Nana in the Nana area. I picked the hotel for the sole reason that is was 260 meters away from the Nana BTS. When I was all on my own, the first thing I did was, I went to Chit Lom and bought a day ticket for BTS. 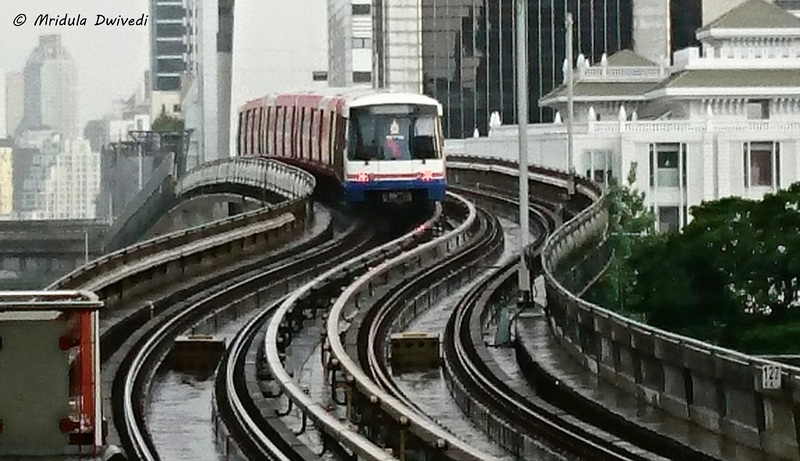 Bangkok has three lines the BTS (sky train), the MRT (underground) and the Airport Express line. But the trick here is that unlike Delhi Metro smart cards and Oyster Cards in London, the lines here have separate cards. 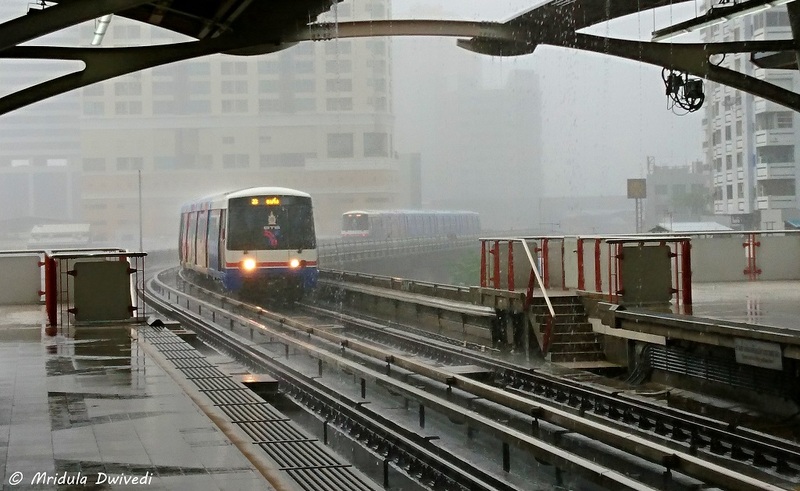 The day card for BTS will not work on MRT or the airport express line. I used the BTS the most. A day pass costs hundred and twenty bahts which is roughly 240 Indian rupees. From what I understood it give me 140 entries to the BTS. Every time I would complete a journey, it would detect 1 baht from my account which meant I could enter and exit hundred 140 times during the day. It is much more than you would ever be able to use in a day. 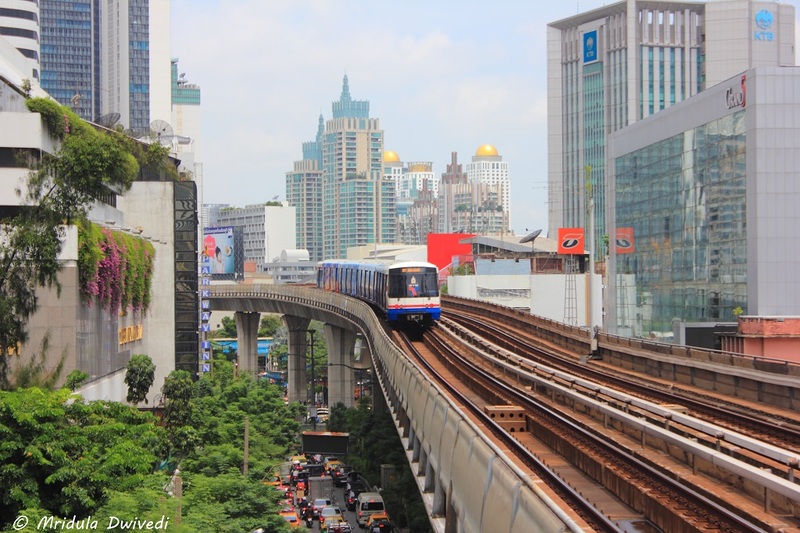 Bangkok.com has an excellent post which lets you click on each of the stations and see what to explore nearby! I relied on it heavily to find my way around the stations. All the BTS stations has staff at the ticket counters as well as on the platform. At the platform there is always security. I found the staff courteous at all the times. The security would initially get a little confused as to why I was staying on the platform and not exiting! But then I would point out to my camera and everyone would be smiles. All the BTS stations have maps and directions. I only took trains in wrong directions twice but that is just me! I knew from my previous experience that Saphan Taksin was close to Asiatique (you need to take a ferry across) and the riverside activities. However I have done all that on my previous visits. This time I just strolled around and went back to the BTS. My adventure was to visit Udom Suk which has a quaint local market. There was no tourist other than me, hardly anyone spoke English. I bought rice cakes and like all street food in Bangkok they were excellent. There was a lady in the market who spoke English but as we started chatting, she got customers. And business comes first. My point was just to go around, explore, get down at any BTS that caught my fancy. I know you must be thinking what kind of a mad person would do that but that is just me! Not Everyone Plays Pokemon Go! 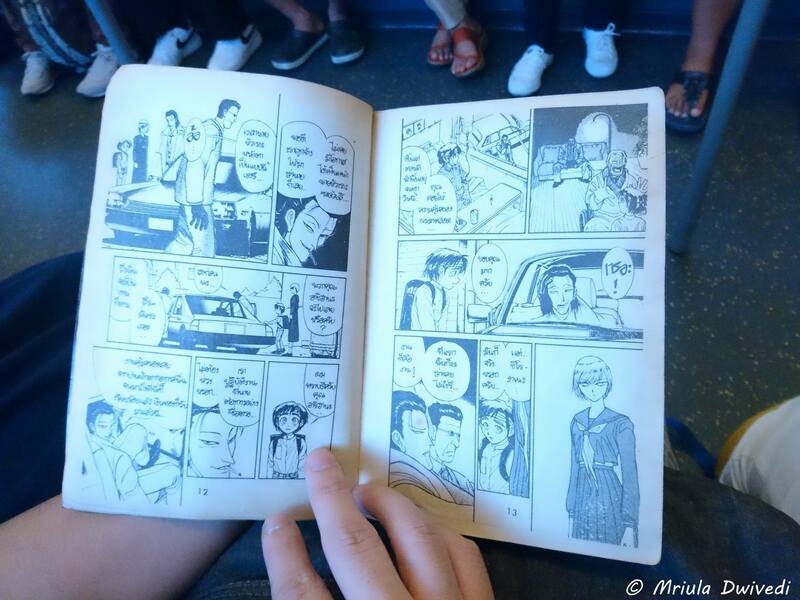 There was a young boy who was reading a comic book in the BTS and I asked him if I could click a picture. He was happy to let me click. There were times when I was the only tourist in the entire train but that was because I was moving out of the tourist areas. If you remain within the main attractions, many tourists use the BTS. It makes a lot of sense as you can easily bypass the legendary traffic of Bangkok. However at the peak hour the BTS gets crowded like anywhere else. It no longer remains a joy ride. At the peak hours you can still use it because people are courteous and polite, people queue up. But use it only to go from point A to B. It is no longer a joy ride! On my last day I took the Airport Express link by changing from BTS at Phaya Thai. Even though I had a day pass for BTS, I had to buy a separate ticket for the airport express line. Not every station of BTS has elevators or escalators. There was an escalator at Nana to lug my heavy suitcase up the station. But I could not find any to get down at Phaya Thai. The Airport Link has escalators and lifts. I had an interesting conversation with a boy from Germany on my way to the airport. He asked me if I am an Indian? I said yes and he asked- “so do Indian women travel solo?” So I told him about the story about me being a travel blogger and how I was hosted and how this was the first time I was extending my stay in Bangkok. Otherwise I never took the airport express, I am treated like a princess by the Tourism Authority of Thailand, dropped to the airport in fancy cars. Next Time There Will be an Oyster Card in the Picture too! But it was fun to explore Bangkok by BTS on my own. It is pocket friendly too. It helps you to avoid traffic jams. Only at the peak hours the BTS gets crowded. So next time when you are in Bangkok, buy a day pass and explore Bangkok by BTS. It is super fun and it will take you beyond the regular tourists spots too. I could touch one terminal station Bearing this time. The next time, I am going to do better! Next time I am also not going to return my Oyster Card, I am going to keep it as a souvenir. PS. I was invited by Tourism Authority of Thailand on a FAM trip. However, I extended the trip to explore Bangkok by BTS on my own. Prasad I used the BTS also known as the Sky train the most. My love for them is recent! But it was fun to explore Bangkok by BTS on my own. It is pocket friendly too. It helps you to avoid traffic jams. Only at the peak hours the BTS gets crowded. 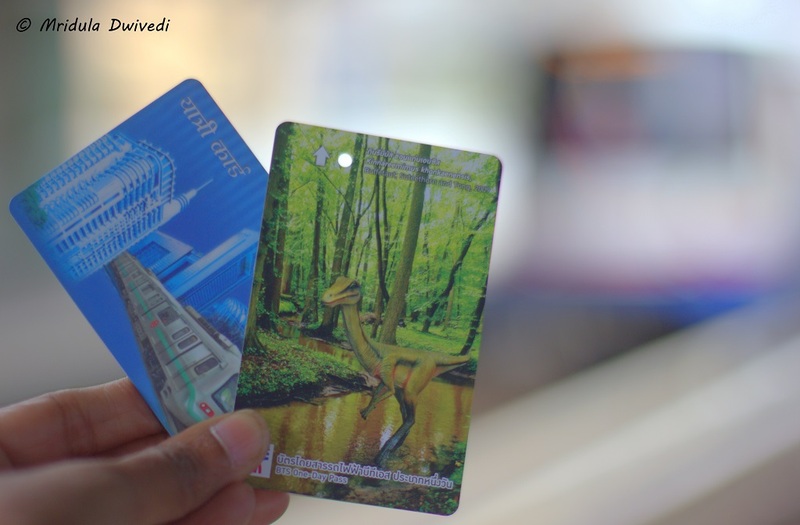 So next time when you are in Bangkok, buy a day pass and explore Bangkok by BTS.Public transport is always a better option to travel in metro cities . Delhi metro is being a favorite transport of millions . Delhi Metro is my favorite too! 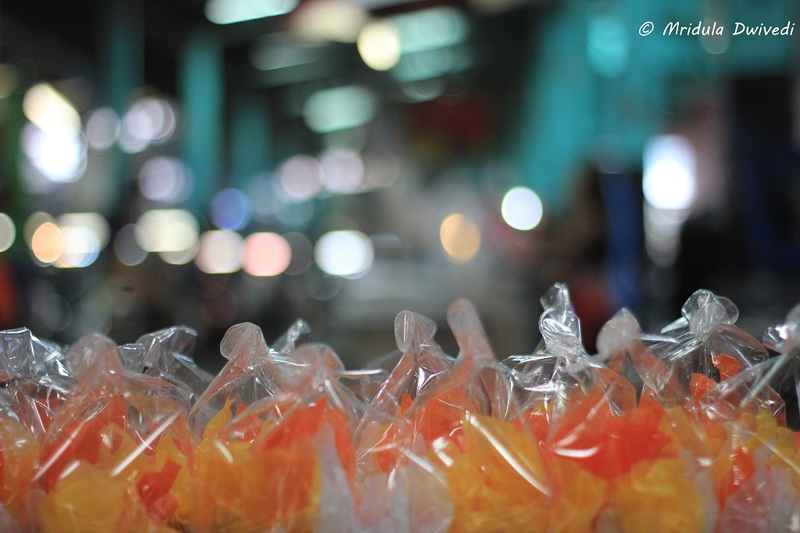 As usual your personalised blog posts with the candid photographs are such a pleasure to read and look at. Thank you so much Kalpanaa! My choice too is metro. Along travelling you get an unique experience. And it seems to be true the world over! The photograph in which BTS entering the curve is amazing. It was fun to ride the BTS through your post. The card says Yatri card in devnagri? looks like they do care for Indian visitors in Bangkok. The green one is the BTS card and the Blue one the Delhi Metro card! Just put them together for fun. I almost always have the Delhi Metro Card in my handbag! The metro has been my favorite to commute in Delhi-NCR being the most convenient, pocket-friendly option..I feel that could be extended to tube elsewhere in the world. Mridula, your BTS experience with helpful details surely is a post to be bookmarked for Bangkok travel. Bushra you will love the BTS too, pocket friendly again only you have to avoid the rush hour. 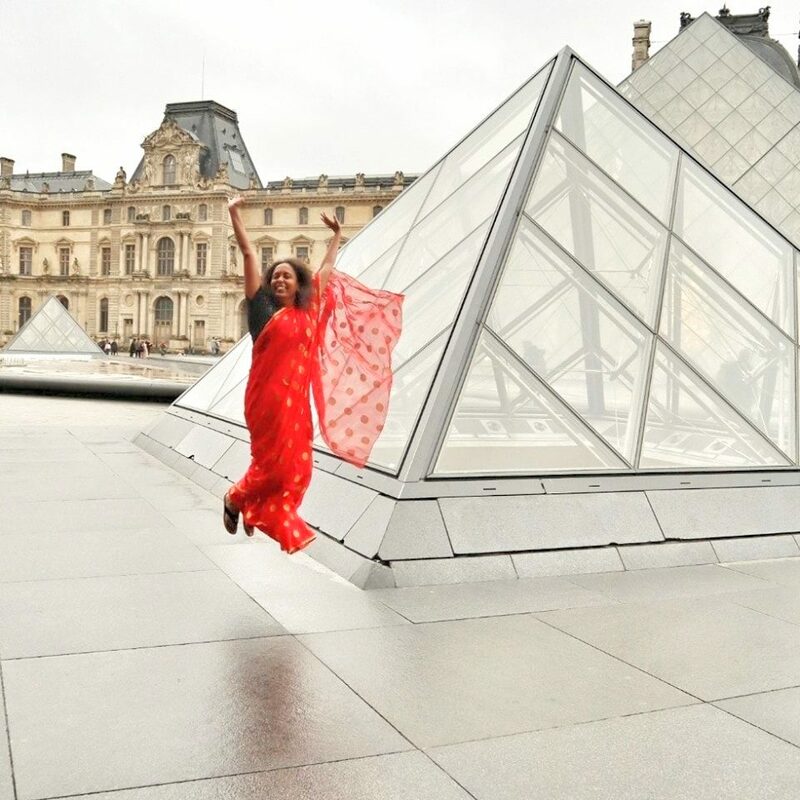 Metros indeed are fun to discover a place – and that too, without any hassles. Loved your experience.